Greg's "real" job is as a technical executive for Global Foundries where he has been since 2015 and with IBM before that since 1996. He currently holds 8 patents for semiconductor technology development work done at IBM. Greg completed his Bachelors degree in electrical engineering in 1989 at Columbia University in New York City. He then completed his Masters and Doctorate degrees in electrical engineering in 1991 and 1998 at the University of Notre Dame. 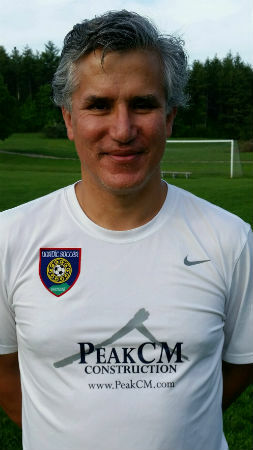 Greg has six years coaching experience with boys and girls U12 and younger. Greg also has past experience coaching ODP and college level in Region 1 (New York), Region 2 (Indiana) and Region 4 (California) between 1986 – 1991. Greg grew up in Northern California and started playing soccer at age 5. He was named a Parade High School All-American in 1985 and played for the US Junior National Team from 1983-85. He also played for 4 years at Columbia University from 1985-88 where he earned All-Ivy League recognition in 1986-87 (Honorable Mention) and 1988 (1st team). Greg is married and has 4 children (2 boys & 2 girls). His oldest son is currently playing with the Nordic 2007 boys team. He is an amateur chef. From 1996-2001, he was an amateur competitive ballroom and latin dancer where during the filming of Me, Myself and Irene, he was asked to help teach the cast to Tango, including Jim Carrey and Renee Zellweger. His other claim to fame was being asked to be the voice of Charlie Brown at age 8. His parents declined! United States Soccer Federation "D" license.